We're currently in Vision Design, you don't have to read after the big blue bar stating "YOU ARE HERE", it's just going to be plans for the future but we're not there yet. The point of creative design is to define the world and story for the set. What are the elements that the audience is expecting in a world with this specific flavour? It's all about finding tropes. Rezatta (concept name) is new plane based on Renaissance. The plane of Rezatta lives at the pace of a perpetual cycle. At times it's cloaked in a dull winter and nothing really happens. But when the muses return, they bring a surge of emotions that rushes through the plane itself and wake everything up in an ecstatic spring. Everyone is suddendly inspired by the presence of the muses. Artists create wonderful masterpieces that spontaneously come to life, explorers unravel territories never heard of before, and geniuses make breakthrough discoveries all around the plane. Among other creative details, we discussed having nice nonblack faeries (likely white/blue), sirens since they are naturally gifted singers and gorgons since they are naturally gifted sculptors because — well, you know — they kind of turn people into statues. 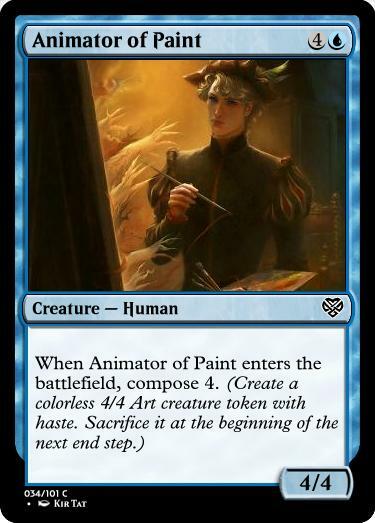 - A Da Vinci planeswalker, whose genius mostly comes from finding inspiration by visiting other planes from time to time. - A mute girl that manages to "speak" through music. Think of creative design as a parallel process to designing the cards. We'll incorporate elements of the story slowly through the building of the set, from legendary creatures, to story spotlight cards, to names, creature types grid, flavour texts, etc. - The main theme is Renaissance, which makes the set a top-down design. - The secondary theme of the set is emotions, which are brought to the plane by muses. - Art is one of the main tropes to give that Renaissance feel. On Rezatta, art is so vibrant that it spontaneously comes to life! 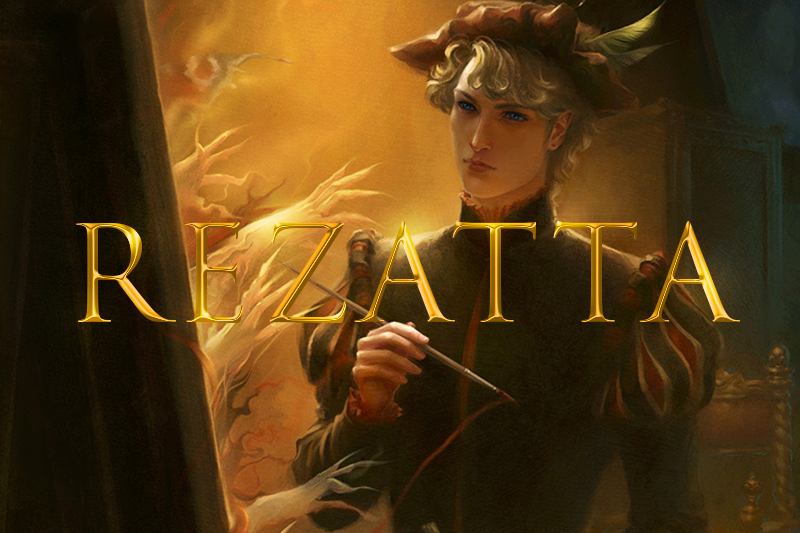 - People on Rezatta also make major breakthrough in science and warfare. - Another important theme is exploration. - Many other themes from Renaissance can be used: humanism, religion, royalty, etc. 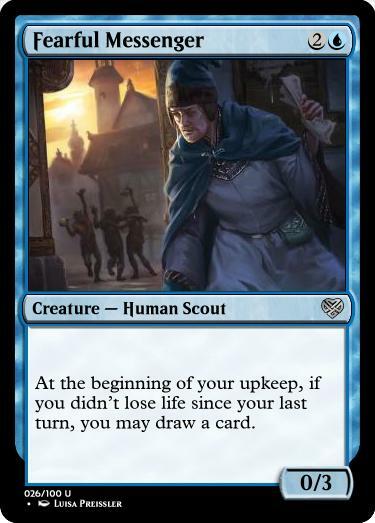 Rezatta is a "Life-Matters set" just like Dominaria is a "Legendary-matters set". N.B: It has been under discussion to replace "reborn" with "legendary". 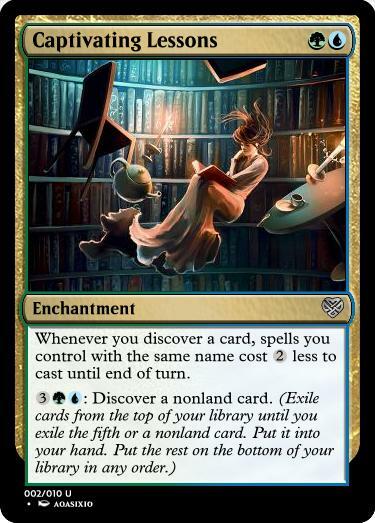 N.B: An earlier version read: "Reveal the top three cards of your library. You may put a THING card from among them in your hand. Put the rest on the bottom of your library in any order." This is the stage we are at right now. The main goal of this stage is to create a design skeleton and fill it rarity by rarity, starting from the commons, then do the first playtests so you can iterate until you are confident enough about your themes to go to the next stage. 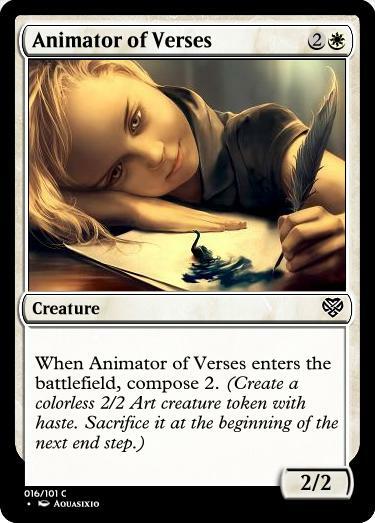 Vision design ends when you've designed a full set of commons and uncommons plus enough rares/mythics to play your first draft. We are at the beginning of this stage, so right now we need to make the design skeleton for commons and fill it to have the first all-commons playtest. We're building a large "standard" set of 269 cards. For the commons, I already have a set skeleton that we can use, but I'd like to know first if anyone wants to build one together from scratch, just because they are interested specifically in set design and would like to have a try at it for the fun of the exercise? We need 19 commons for each colour (roughly 10 of which will be creatures), 3 common artifacts and 3 common lands. 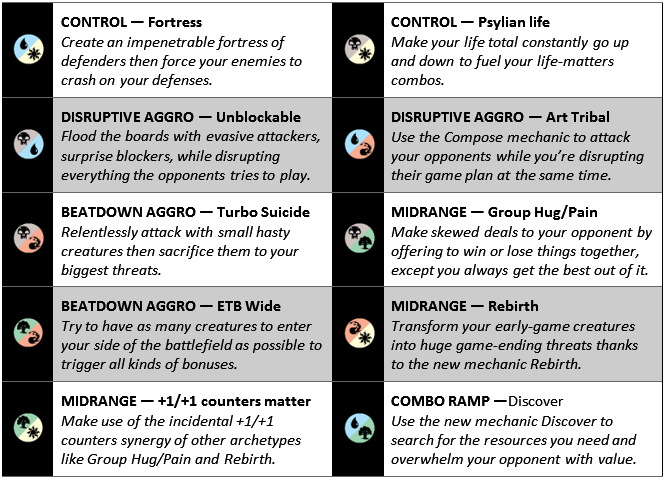 After re-reading all the Nuts & Bolts articles, I realized that it was probably a good idea to take a step back from directional design and let the mechanics show us where they naturally want to go, at least for the first playtest. So, for now, you don't have to care about what are the synergies of each colour, just assume every colour has access to every mechanic and that you are designing card in a vaccum while respecting the mechanics and themes of the set. What cards are you expecting to see at common? That's what we need to design to make the set go forward from this point. BELOW ARE THE FUTURE STAGES. 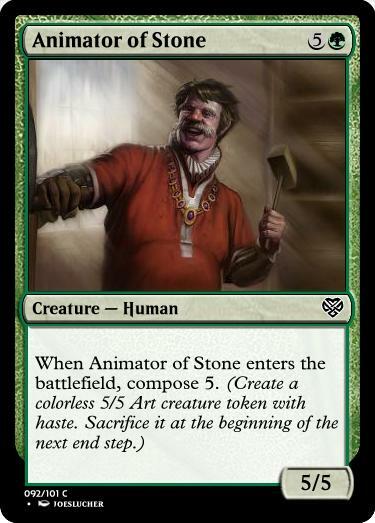 - All-commons limited plays weird. It's a bit less fun than normal Magic, don't judge the set on that. - We're focusing on which individual cards are fun or not. You can have 99% of cards with a specific mechanic be horrible and the mechanic still be viable. - We're going to take notes about cards we played with/against. The point is to gather information on what works or not. Based on the feedback we get from the playtests, we'll be able to iterate on the design skeleton and start to shape the identity of each mechanic and colour. 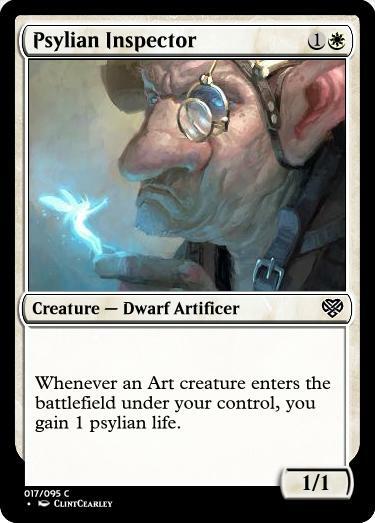 a. Psylian life: Primary in White/Black/Green because they are the life gain colour, secondary in Red/Blue because it's the flashy mechanic of the set and probably deserves a little colour pie bend for this set. b. Discover: Primary in Blue/Green because Blue represents progress in science while Green represents exploration of the new world. 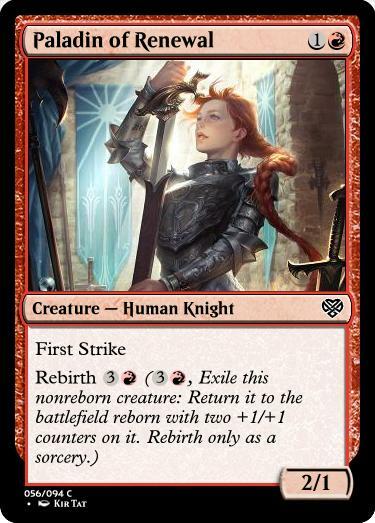 d. Rebirth: Primary in White/Red for colour balancing reasons, which makes them care about going tall, an uncommon Boros theme found with the Lorwyn giants for instance. Based on those archetypes, we're going to create the glue of the set, the commons that tie different synergies together. Nuts & Bolts are very specific about this advice: there's no reason in caring about uncommons as long as you're not 100% satisfied with your commons. They're the core of the set, we have to make sure the mechanical heart of the set is showing at commons. 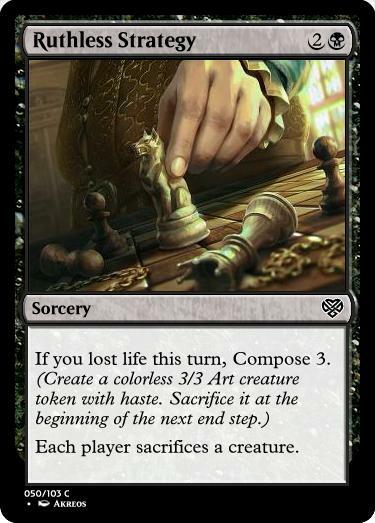 Then, repeat everything you did for the commons but with the uncommons. Be aware that this is the rarity where we'll likely be mising the most room. Vision designs stops when you have a full set of commons, uncommons, and enough rares and/or mythic rares for a draft. At this point, well, you're ready for your first draft. The set design stage is made to find the pace of each theme and mechanic, we know where we're going, we need to find the best way to arrive there. At the end of this stage, the set should basically be playable and fun. The play design stage is made to question every aspect of every card. It's about making sure that each archetype is balanced and has the tools it needs in Limited. That's when you get to care if a specific creature should be a 2/2 or a 2/3, if it should cost 2W or 1WW, etc. CONCLUSION — TOO LONG; DIDN'T READ: WHAT CAN I DO TO HELP? Tell me what kind of designer you are. What aspects of the set do you want to help with? - You have entered some contests on MTGCardsmith before. - You want to be involved in a cool project without commiting to anything too complex. - You are ingenious and have a lot of cool ideas for new cards. Then you can help designing exciting cards in a vaccum for the set. All you really need to know is that it's a set about Renaissance, and you need to read PART 2 - B : MECHANICS of the introduction above. - New tropes about Renaissance. It's a very difficult theme to tackle. What's the first thing that comes to your mind when I say "Renaissance"? Well we need cards out of that! - Top-down designs on iconic characters from Renaissance like Da Vinci. - Top-down designs on iconic masterpieces from Renaissance like the Sistine Chapel. - Top-down designs on our main themes like art, exploration, science, humanism, etc. - Bottom-up designs for the life-matters theme. What are the craziest things you can think of that involves life points in MTG? - Any cool ideas of Renaissance planeswakers? - Any idea for our exciting Mythic cycle, the five Grand Muses of Bliss, Fears, Sorrow, Ire and Love? They must be really splashy and really flavourful, like Gods or Elder Dinosaurs, but feel unique. - You have designed plenty of cards, but you're really here to design a set as a whole. - You are methodic and are not afraid of designing a bunch of commons if needs be. Then you can help advancing the set from its current point. You're going to need to read the whole introduction so you know what we're talking about. - We're making a set skeleton for the commons. My main inspiration is the set skeleton of Amonkhet since it's the most "vanilla" of recent sets from a set skeleton point of view (no colorless eldrazi taking slots, or DFC, or artifacts, or tricoloured tribal, etc.) 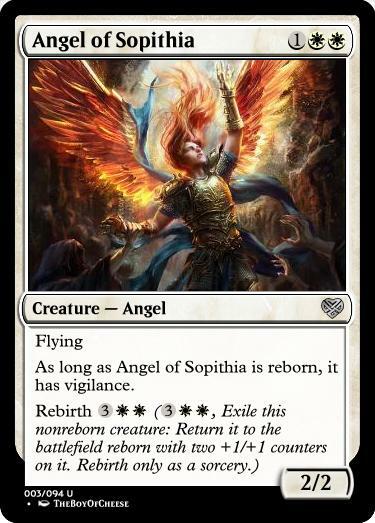 but Dominaria will likely give us a really good second point of view where we could start fresh. - We also need to fill the set skeleton with commons. The very first thing we need is to test the mechanics (incuding the life-matters theme). Try to design common cards that could give us information on what works and what doesn't with each mechanic. I'll post some examples below within a few days. Also, a cool cycle of common enchantment auras like the Cartouches of Amonkhet could be of huge help. - You have read many official Magic Stories before and identify as a Vorthos. - You want to shape a new world and its stories. - You are creative and have an artistic vision for the set. Then you can help with the creative aspect of the set. You're going to need to read a bit about Renaissance to know the source material. - We're still discussing the nature of the main conflict. Is it a war? A race? A fish-out-of-water story? Are we dealing with a world-ending threat? Is it more intimate? - Who are the main characters? Finding compelling characters will help shape the story. Also, we have two remaining planeswalkers slots to fill. 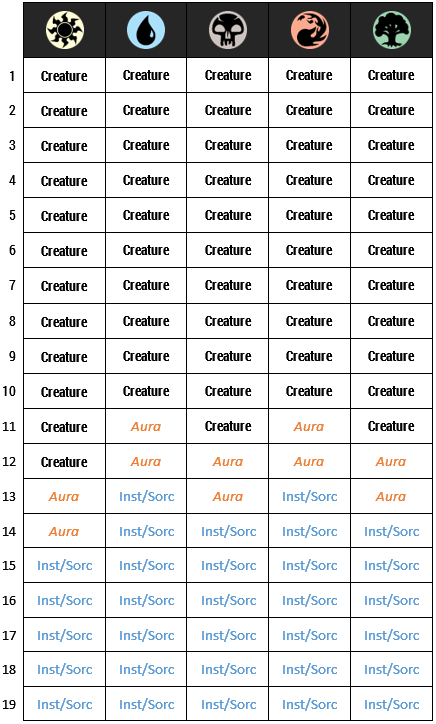 - The creature grid: What kind of creatures inhabits this world, how are they distributed between each colour on the cards in small/medium/large and flying/nonflying categories? I would be fine making cards, but cannot be 100% committed, and I use art for inspiration, so I am here if needed, but will not be joining now. Are we focusing on the Italian Renaissance or can we do hw Northern Renaissance also? While this set was initially inspired by Italy, the Renaissance spread all throughout Europe and beyond, so feel free to take inspiration from anywhere! Hey there! I’m pretty late to the game, but I’ve been eyeing this project for a while. If it’s not too late, I would love to grind through some commons (aka accidentally design uncommons) and participate in the early design skeleton building and all-common play test. (I’m currently half way through the nuts and bolts articles and reading them in my free time.) 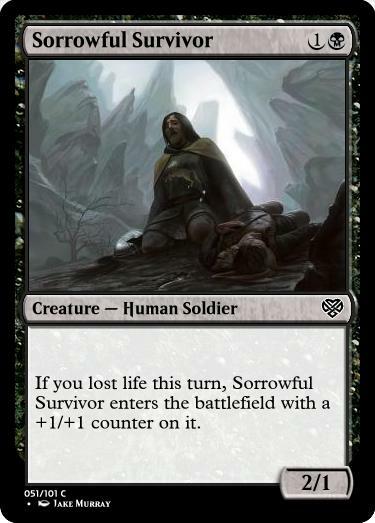 I’d also love to work on a mythic rare or two when the time comes, but we’ll cross that bridge when we come to it. Would it be too late to hop in on this project? Id be glad to take part in the design process! if you have any room for more just let me know and i'll be glad to smith you some common cards ^^. im also quite fond of play testing if you need a hand. I’m still in this to see it to the end, so I’d be more than happy to do whatever the immediate priority may be at the time. I am in college double majoring in art and economics, so this is super me. So I am down for the whole shibang, but will naturally lean toward one or two of the aspects as our own little weatherlight crew develops. For cards, I am an artifact obsessed Johnny. I find I lean toward naya in my design and lean toward izzet in my play (yes I am in love with the new Jhoira). I have found trouble looking Renaissance art. That is my biggest huddle for this. I want to try making a piece for this set, since I adore Rezatta. Macroconcepts of our gameplay, the mechanics are very value based. Extra life, extra mana, extra cards, tempo tokens. With that in mind, think pretty aggressive vanillas and decent common aggro is going to be extra important. I think we could double the multicolor count of normal sets and be fine because of all the extra value. Cardsmiths love making multicolored. Storywise, I want a white gorgon (or a red one if the aven mentioned previously is still a plan and would be blue white) if we are letting them sculptors. I think from art history, The most be interesting story of the renaissance was one of the following: the feud of Ghiberti and Brunelleschi, the Medicis of Florence funding dozens of artists like a league of artists, or the personal endeavors of the ninja turtle artists. My personal favorite is the first. Caravaggio would also be a great character in any case. I would prefer people more oriented to story to also bounce out ideas. Other tropes are interest in philisophy, the belief that music was the most divine art, artists working for nobles or wealthy guilds, folklore and myth callbacks,Magnum Opuses, the dangerous journey to study in Rome, dissection, fancy doors, domes, art contests, and heraldry. @icyyou Same, welcome aboard! And we'll make sure to notify you once the first all-commons play test happen, which should be as soon as we get a full sheet of commons. 2) I suggest we make 19 commons of each colour which is pretty standard for a set with nothing weird going on like a strong colorless or multicoloured theme, Amonkhet for instance has 19 commons of each colour. 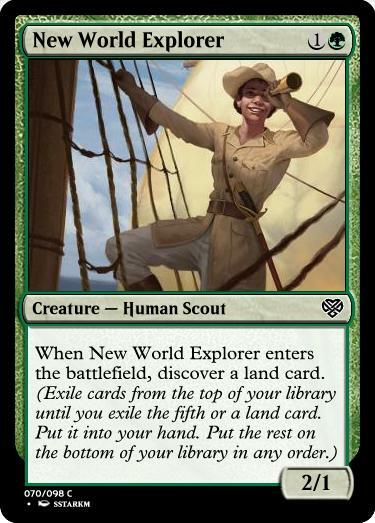 3) This leaves us 6 slots for lands and artifacts. We could push one direction or the other (Amonkhet, for instance, had 4 lands 2 artifacts because of the Desert theme) but since we don't lean towards one or the other, I suggest just making 3 artifacts and 3 lands for now. - I can make it evasive to be agressive. - I can use it as a sacrifice fodder. - I can count the number of creatures I own. Wow Very informative and clean. 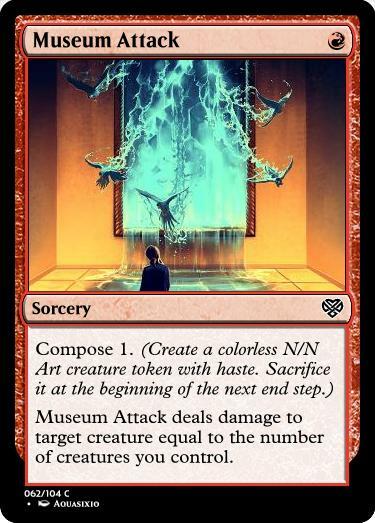 I Already like the idea behind ruthless strategy and museum attack. 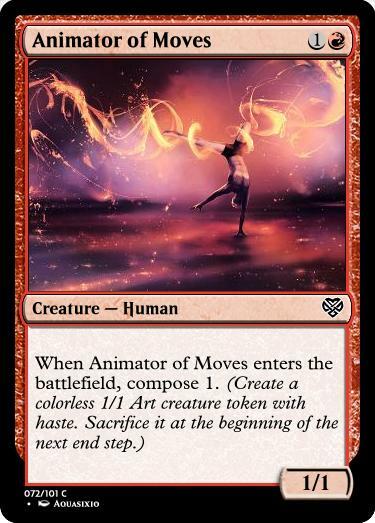 Having the token matter by it simply being an extra creature makes it feel like a real and exiting mechanic. @ningyounk If I am to make cards, is there somewhere I should drop it ? if we keep all cards he, it might get crowded and harder to read. Well, the things that come in mind for me when I think "Renaissance" include the plague, churches, and naked people. Good luck with that! What about a female DaVinci? I'm just having trouble with the name. +2: Exile the top card of your library. You may cast that card. If you do, compose 2. -2: You get an emblem with "You can't sacrifice Art tokens." -8: Exile the top ten cards of your library. An opponent separates those cards into two piles. You may cast any number of cards in a pile without paying any of their mana costs. 3, T: Compose 2. Activate this ability only if you have cast a spell this turn. 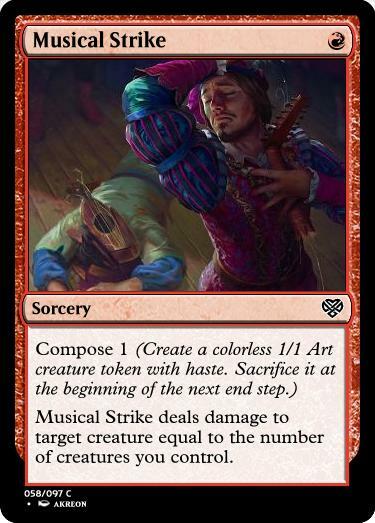 Whenever you compose, ~ becomes a 5/5 creature until end of turn. Untap it. 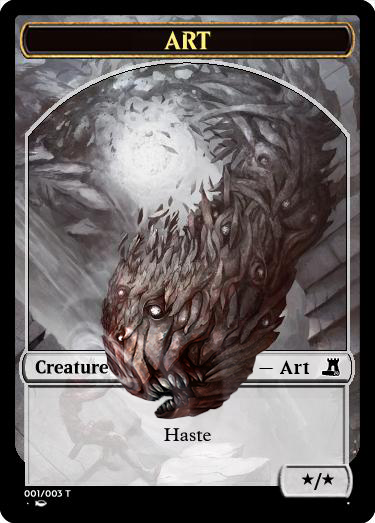 When Vitam Agere enters the battlefield, each player creates a white Avatar creature token with hexproof, indestructable, and "This creature's power and toughness are each equal to your life total." Whenever an Avatar is dealt damage, its owner loses half that much life. Whenever you would be dealt damage, you take twice that much damage, then you gain 2 psylian life. WW: Target player gains 1 psylian life. BB: Target player loses 1 life. 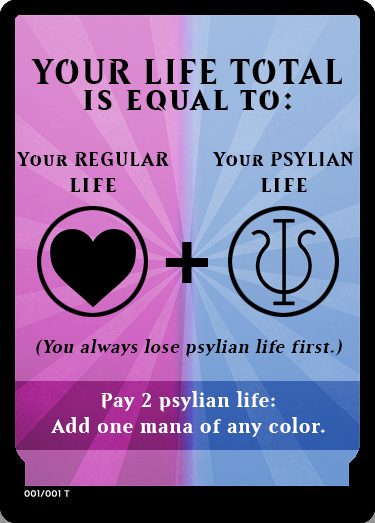 At the end of each turn, if your regular life total is equal to your psylian life total, you win the game. Hopeful Recruit's power and toughness are each equal to your life total minus fifteen. T: You gain 1 psylian life. If the Grand Muses are fickle and leave often, what about an ability that makes then cycle through player's battlefields. Like this? At the end of your turn, if you didn't cast a red spell this turn, target opponent chosen at random gains control of Grand Muse of Ire. Whenever another source you control would deal damage, it deals that much damage plus 1 instead. Nice, I’ll work on some compose cards. - We did talk about the plague at the beginning of creative design and kind of forgot the idea because we tried to push in more optimistic directions, but that's still something resonant so I really think we should explore and see how it really feels. - I like the Sistine Chapel as an utility land but didn't get what Ogolio was refering to? - A really original take on the Muse's cycle aspect! I like the concept of it, it may be worth exploring this very unique design space though they are the exciting Mythic cycle so they have to be tweaked so they don't make you feel bad for playing them! You're a visionary lead. I'm repeatedly impressed. Ogolio was referring to the many sculptures and statues created to represent the pinnacle of perfection in mankind, e.g. David. What about this text for Wondersmith? If its not to late, I want to join the "i just want to make cards group" I could create some simple commons that add to the flavor to the set. 1Ghiberti and Brunelleschi were rival sculturas in Florence in the early renaissance. They entered a contest seeking the world's best sculptor to make a cathedral door. After ten years and the topic "The sacrifice of Isaac," they submitted their work. Ghiberti won unanimously because of his dramatic foreshortening. In his bitterness that he was not the best sculptor, Brunelleschi quit sculpture and became an architect. He quickly became the best in the world, designing many of the stand out buildings in Florence, but he always hated Ghiberti after the contest. Perhaps a parallel to the brother's war in our plane or a rivalry to be the numero uno? 2Carravaggio was a rough dude. He gambled, hung out in bars, was arrested for getting into fights and burglary. The thing about him was that he was one of the best representative painters the world has ever known. So, the church would buy him out of trouble and patroned him. Bit duplicite huh? He could be a fun character to write. 3The trip to Rome was an art tradition before photography existed. Since Rome and Greece are seen as the beginning point of intelligent western art, it was a custom for artists of all disciplines to make their way to Rome. Mind you, this was before many modern era changes so you couldn't just fly there. You had to boat down a treacherous sea and weave your way to Athens or Rome through bandit filled roads. This could serve as a bigger story should that be a struggle to find. The artists seeking the touch of the muses could have to go on a similar perilous struggle. I’d like to help design the set. I need to practice designing sets. So yeah, that's definitely something we can try! Alright! Would you be interested in trying to pursue the making of the design skeleton for instance? That's definitely an important thing to pratice if you like to make sets ^^ I'll let you have a pass, from where I left it if you're interested. What would be your next step? @brcien, I really like the idea of a Caravaggio character, because it highlights the imperfections of a ruling body. I think it would be a great way to breathe some life into the religion of Rezatta. This brings up the question, 'What is the religion of Rezatta?' If we want to include a Caravaggio story and/or emulate the dominance of the Catholic Church during the Renaissance, there should be a powerful religious body that dominates the plane and tries to repress other religions. Perhaps this could be tied into the story of monks during the Dark Ages (the equivalent of the time between emotional "springs" on Rezatta when the Muses return), where devout followers of the religion preserve knowledge during those times and bring their religion back into the ruling position with the return of the Muses.